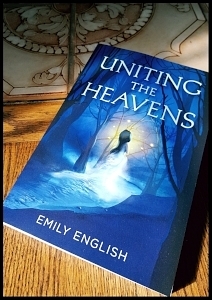 So, my wife wrote a book - Uniting the Heavens - and it's a pretty darn good one at that! She's had a life long dream of writing and publishing. In fact, I dare say our romantic relationship bloomed due to our love of writing. It's something she and I have always been drawn toward. In the beginning we had "Coffee Thursdays" together at a local coffee spot. We would sit on an over-sized comfy couch, drink coffee, laugh, and discuss the various writings we had composed since our last meet up. Over time, the poetic words on the page seeped into our hearts, cardboard was thrown, love ensued, and we married. During those early days on the couch, my wife presented me part of a very rough draft of what would become Uniting the Heavens. There was a city by the sea, gods and goddesses, and a dashing young hero. The story and characters continued to play in her head for well over a decade, begging her to release them from captivity. When she could take it no more, she undertook the painstaking process of writing, editing, rewriting, reediting, trashing it, writing some more, and editing a lot more until it was all out and resting comfortably between a pretty paperboard cover. This process took place over a course of five years—practically every night. After work, after dinner, after taking care of the kids, after taking care of the bills, and all of life's fun responsibilities, she would write. Now that the book was a reality (and a virtual reality), we only had to sit back and wait for the droves of readers to come beating down the door and chuck their hard earned wages at us. So we waited. Initially, there were a decent amount of books bought right away —mostly family and friends who were excited to know a real, live, author. But where was the general Fantasy-crazed populace? In hiding. Most likely burned out on dystopias, bored of vampires and werewolves. They were looking for something new and exciting—longing for romance, adventure, and enigmatic gnomes! Uniting the Heavens was the perfect book for them. It must get to them with all due haste! How come building a website and putting the book on Amazon was not enough to reach these poor gnomeless souls? Now that the book is out there, we’ve discovered there's a whole new beast we must slay called Marketing and Promotion! In the coming weeks I plan to write various blog posts on strategies aimed at taming this woeful creature. I’ll be sharing our experiences on various topics like: Author Must-do’s, giveaways, contests, conventions, pitfalls, and search engine optimization (SEO). Armed only with years of government consulting experience and a faded business degree, I plan to document each lunge, parry, and riposte as we maneuver through the perilous world of book promotion. I invite you to come along for this amusing, and hopefully successful, dance with danger.